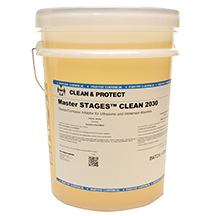 Master STAGES™ CLEAN 2030 is a concentrated, very high-performance cleaner made for washing iron and steel parts and applying a short-term corrosion inhibitor in single-stage ultrasonic or immersion washers. Its cleaning ability is extraordinary, which often leads to shorter cleaning cycles or elimination of cleaning steps. CLEAN 2030's oil-rejecting properties mean longer bath life and economical operation. CLEAN 2030 can also wash most other metals including brass, copper alloy, aluminum, zinc, and magnesium.